For more than 25 years, Viviscal® users in more than 25 countries have stopped their thinning hair and enjoyed stronger, healthier hair. Now you can, too! 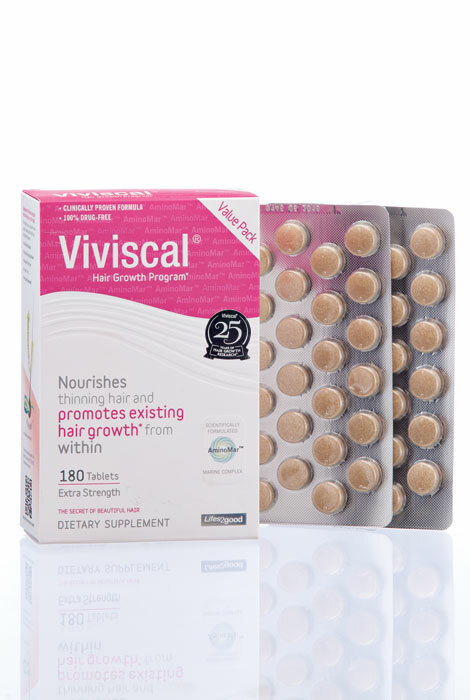 Doctor-recommended 100% safe, all natural, drug-free Viviscal® Hair Nutrient Tablets are clinically proven to support and maintain natural hair growth from the inside out. Containing the exclusive AminoMar C™ Marine Complex from Scandinavia, Viviscal® hair vitamins nourish hair and scalp to encourage growth of existing hair and help “restart” dormant hair follicles. * Hair is visibly stronger, thicker and more vibrant in as little as two months. This value pack of 180 hair vitamins is a 3-month supply. Those allergic to seafood/shellfish should not use this product. Take 2 tablets daily for a minimum of 3-6 months (1 in the morning and 1 in the evening, taken with water after food). Thereafter, users may reduce their daily intake to 1-2 tablets daily if desired. However, many users choose to remain on Viviscal beyond the 6-month program in order to maintain optimal hair growth results. Although my hair has still a way to go, it already looks like my thin spots are filling in and my hair looks healthier. I have only been using for 3 months, so it's amazing that I'm already seeing results. I will continue to use for at least a year and see what happens, but I am very pleased with this product as of now. I have seen my hair line fill in with new growth and my hair grow longer and stronger since taking this product. It does take about 3 months to realize notice results, so you have to commit for awhile before passing judgement. While I try to take 2 a day per the instructions that doesn't always happen. Regardless I am very pleased with the results of this product and will continue to take it. These tablets truly help thinning hair. I was a bit wary of the reviews but after a month of taking these supplements I see some change, even my eyebrows are filling in. My dermatologist recommended I use this product to aid in my hair loss issue. I have been taking it for 6 months and it is working well. I have read that it works, but I don't really know. Have been taking it for 3 months and cannot tell a difference in hair or nails. Purchased before and seems to be working. what is the different between viviscal and keranique? BEST ANSWER: Thank you for your question. Please contact our Customer Service department at 1-800-203-1235 for further assistance. We hope this information will be of help to you.